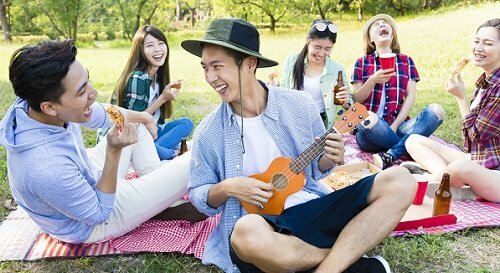 Whether joining a ukulele group is your first move to learn to play the uke, or home practice has gone boring for you, you can’t dismiss the fact that joining a uke club has its perks and benefits. Below are some notable ukulele societies and clubs you should check out. This group combines love for the ukulele and community engagement. Established back in 2010, where its uke jams use to be at college campuses, the local YMCA, and in cafes, it is now expanding its reach to local schools, nursing homes and and service groups. The group leads ukulele jams (they play in G6) every second Sunday of the month and have a constantly updated songbook that can be downloaded online. If you believe that everyday needs a ukulele, it’s worth checking out the Bellingham Ukulele Group (BUG). This vibrant community of ukesters which started with a measly group of 25 now has a calendar full of ukulele activities. On top of its Thursday night uke practices, it also organizes campouts, and house jams they call House BUG. Some of its dedicated members have also put together a ukulele orchestra that performs during the group’s winter and spring concerts. From this group’s recently concluded event, Ukulele Uprising II, one cannot deny the Delta Strummers’ passion for the little uke. Uprising, being such a powerful word, is a manifestation of this group’s love for the instrument. Starting out as a group of two couples who decided to make music together in 2005, it has since grown in numbers and became a phenomenon in the East Bay. The group holds an active beginner’s program which serves as a practice before transitioning to the main band. A community based ukulele group that is motivated in propagating the study, practice and enjoyment of music with emphasis on the ukulele, singing and percussion instruments. One of their notable program is the Vaela’s Residential Kitchen Band that encourages residential living facilities and community organizations to motivate their residents to join community activities. Their website lists their pretty busy (but fun) calendar of ukulele jams and activities. If you are in the Puget Sound area, the Seattle Ukulele Players Association invites ukulelists to join their ukulele song circle during the dog days of summer. SUPA is a non profit corporation established in 2003 promoting fellowship, entertainment, performance and education among ukulele lovers. They meet on every second Sunday of most month to strum, jam and have fun. Wherever you are in the ukulele skill ladder, the San Luis Obispo Strummer will welcome you to their friendly family. At the core of this group of ukulele enthusiasts is fostering ukulele skill improvement and camaraderie. They have printable and downloadable music sheets online that are used during strumming sessions. Visit the SLO Strummers website for more information. If you feel that your walls have gone tired of listening to your ukulele playing, it might be time for you to join a group to share your uke skills. If you are in North Boulder, Colorado, the Boulder Ukulele Group might spark your interest. This is a group of musicians that assembles once a month for ukulele strum alongs. They are systematic in choosing songs and inclusive of all member in the process. Just follow their submission guidelines and your favorite song can be part of the group’s next session. The Toronto Ukes website asks its visitors; “are you all uked up and have no place to jam at?” Now at its 5th awesome year, Toronto Ukes continues to bring uke-centric events, activities and workshops that can let you release that built up ukulele energy. Toronto Ukes takes pride in giving its members the complete awesome ukulele club experience. With effective leadership, the group launches events with fluid flow and buttoned down programming where fun traditions and rituals are practiced. Its members also enjoy superb instrumental support, dedicated volunteers, monthly theme nights, unique offsite activities, a weekly eNewsletter to all members, video projection of all charts, and a huge emphasis on musicality, expression, style and groove. Toronto Ukes for sure can make you happy if you are a sucker for ukulele gatherings. They hold three weekly uke meetings. The Brisbane Ukulele Musicians Society Incorporated (BUMS Inc) is one of Australia’s largest ukulele groups. Established in 2007, this is now the ultimate uke society in Brisbane holding jams at six locations. The BUMS’ highlights include big monthly jams held at Coorparoo and Wavell Heights, and small free boutique jams BUMS Scratch (at The Scratch Bar, Milton) and WE BUMS (at the Hope Street Cafe, West End). As the society grew, the jams’ song selection increased in sophistication. This lead to BUMS holding a beginners’ jam at the The Grove Sports Club (Ferny Grove). To cater better for those who can’t travel in the evenings, a daytime jam was established at Toowong. A 30-minute beginners lesson is held before the Northside and Coorparoo jams. On the other hand intermediate and advanced ukulelist members are offered fingerstyle workshop before the Ferny Grove Beginners Jam. The society also runs ukulele bootcamps for beginners to kickstart their ukulele journeys, and hosts concerts and workshops by visiting artists to boost intermediate to advanced players. Another highlight is the biennial SPRUKE festival, which is a three-day event of jams, open mics, concerts and workshops, that brings together Australians and overseas visitors who love the uke. The Folk Project is one of New Jersey’s premier acoustic music and dance organization with over 600 members. It is a non-profit organization that has been showcasing acoustic and traditional music in NJ for over 30 years. The Folk Project is behind the annual New Jersey Ukulele Festival that gathers people for a whole weekend of fun ukulele workshops, performances, spontaneous jams, open mics, and vendors. With a club that has the most extensive collection of songbooks, it’s a must that San Jose Ukulele Club be on this list. The California-based group holds their meetups every two weeks and welcomes ukulele welders of all skill levels. The club has a regular venue that houses them from 5p.m. to 9p.m. so everyone is welcome to get together for dinner before the jamming begins. The first hour and a half of the gathering are dedicated to free ukulele lessons and then it’s all musical fun from there onwards. San Jose Ukulele Club’s songbook can be downloaded from their website for free and is written in an organized and comprehensible format. Being a staunch fighter for gender rights and equality, Canberra has various established groups for music and arts and the Gay and Lesbian Ukulele Band or GLUB is definitely no exception. The members of GLUB, or Glubsters as they call themselves, hold their meetings two to three times a month in a welcoming and informal setup. The main goal of the club is to create a friendly, non-competitive space for gay, lesbian, and queer-identifying individuals who would like to share their love and interest in the ukulele. With only a humble number of around 30 active members, the element of intimidation and hesitation to join and jam with the group can be easily overcome. The Ukulele Club of Chinatown was created in 2009 in hopes of uniting the community and church members of the Chinese Congregational Church. The club was also able to bring back former Chinatown residents and reunite them with the help of music. Every third Wednesday of a month, the group consisting of ukulele players of every skill level gather to play pre-selected songs from English language classics to Hong Kong anthems. Every meeting is different from the previous one because of their monthly themes. The group is definitely perfect for anyone looking to find fellowship and yearning for a spiritual experience. WUC started in 2010 with 5 members and has grown to over 100 on its mailing list. Every Monday evening over 50 members are led through a mix of old and new songs. All newcomers of whatever ability are welcomed and looked after. The Club is steered by an annually elected and active Committee. There is an organized website with Songbooks arranged chronologically and alphabetically available for download. The Facebook pages carry up to date news. Each year the club performs around 70 gigs and collects for a charity chosen by the members. The Club also hosts performances and workshops by guest uke stars. The Club members like to enjoy making good music and having fun! That’s what it’s all about! If you’re a traveler who’s just looking to join an informal group without having to worry about committing to attend the group, then Unplugthewood might just be the group for you. Unplugthewood functions with the idea that “no one is invited, but everyone is welcome.” Around 60 musicians of every instrument, most especially the ukulele, gather in The Lion Brewery in Surrey, England to drink, jam, and perform in open mic sessions. Unlike other clubs, Unplugthewood is very unconventional — there are no regular members and no membership fees. Anyone can come and go as they please, and mere spectators in the pub can find themselves become an audience to a variety of sounds from the performers including pop, rock, and even disco. If you happen to be in the Asian melting pot of cultures that is Singapore and are looking for an active ukulele group to join, then you are in luck with JustUke Strummers. The group is the youngest on this list having been established only in July 2013. JustUke Strummers are located in the Nee Soon South Constituency of Yishun, Singapore, and play mostly Mandarin and dialect songs apart from English songs. They gather every week since they actively participate in various music festivals in the country. A lot of their performances are documented in photos and videos and can be found on their website. Japan is the second home of the ukulele which is why the longest running established group in this list is the Nihon Ukulele Association. The organization is going to have the 60 years anniversary in 2019. The non-profit organization was established in 1959 to help popularize ukulele and hula music in Japan and bring together amateur ukulele players. Many of the group’s original members have already passed away, but NUA is seamlessly active over generations, generating many active ukulele playing units, excellent ukulele instructors, and sharing of useful information for those who love playing Ukulele. With almost 60 years of music making under their belt, not only do they provide ukulele lessons, but the association also offers workshops in other instruments, in music theory, and in hand crafting musical instruments. In the same country is a more informal singing group established in 2009. Kyoto Singing Around the Table’s unique name gives you an idea of the group’s set up wherein people are invited to a local pub and sit around the table to sing along to English and Japanese tunes. Members of the group, who are diverse and come from different cultures, ethnicities and age groups, gather every third Saturday of a month and start with a two-hour ukulele session before singing the night away. The group also has instruments and song sheets available to lend to pub customers and walk-ins who want to join the fun. Ukulele Underground Philippines started as an inspiration from its US-based mother group of the same name whose aim was to spread the joy of playing ukulele music. After getting approval from the US base to be an official overseas affiliate, the group became the Philippines’ official ukulele group. What was started by a bunch of college friends now grew into a supergroup consisting of Filipino ukulele musicians of all ages and walks of life. Some of the members even got to perform at a popular local TV show. This group boasts the biggest number in this list with a growing number of 3,000 members. The Four Strings is a ukulele pub in the Philippine capital region that also houses a ukulele shop and a lot of underground artists. The bar has regular open mic nights that gave way to the creation of an informal ukulele group. Every Friday is the bar’s open jam day where musicians and performers of any genre and skill level are welcomed to perform. The bar also offers individual and group ukulele lessons and takes pride in their campaign of supporting local products. The Four Strings is the first ukulele hang out of its kind in the Philippines and is very popular among young adults. Wirral Ukulele Club is based in New Brighton in the UK. The club has been established for 3 years and runs courses for beginners and advanced pupils. Private tuition is also available. Clive Byron is the founding member and has over 35 years experience as a professional musician and teacher. The club aims to constantly inspire and challenge pupils to improve their skills in a relaxed and fun environment.